Green Talents’ research stays provide useful vantage points to view Germany’s extensive environmental and sustainability science networks. National research systems are often described as ‘landscapes’ but they are actually networks, and Germany’s network is multi-layered and hyperconnected. It consists of some 750 publicly-funded organisations, including 108 universities and 210 universities of applied science and thousands of private businesses. There are also over 100 research networks, some covering sustainability, and Germany is at the hub of many European Union sustainability and climate research programmes. 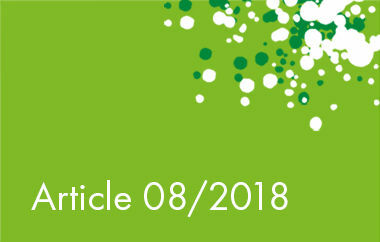 Personal profiles of prominent research leaders can provide a view into Germany’s research nodes, their international connections and connection with Green Talents. For instance, Professor Joachim Schellnhuber is Chair of the European Institute of Innovation Technology Climate-KIC, founder of the influential Potsdam Institute for Climate (PIK) and regular Green Talents panel member. 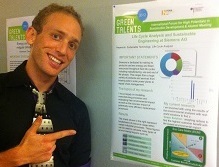 Looking at Green Talents’ profiles themselves, especially research stays since 2009, offers strong insights into Germany’s environmental research hubs and global connections. Universities, of course, work with state research organisations where about 43% of Green Talents made their stay. Juliana Aristéia de Lima (Brazil, 2009) chose to work at Professor Dr Landfester’s research group at the Max Planck Institute for Polymer Research (MPI-P) in Mainz. ‘It gave me the opportunity to start working with Janus Particles and then turn my focus to Transmission Electron Microscopy (TEM). I was also part of a round table discussion with the minister, Annette Schavan.’ Juliana is now a Fellow at the Laboratoire Procédés et Ingénierie en Mécanique et Matériaux (PIMM), Paris. One highly networked institution is unusual in that it is both a university and research centre, Karlsruhe Institute of Technology (KIT), where Dewei Zhao (China, 2010), Research Assistant Professor at The University of Toledo working on perovskite-based solar cells, made his stay. ‘Academics at KIT were positive about industry and my stay provided a foundation for my ongoing research into thin-film solar cells, and I helped create a collaboration between Germany and Singapore. Moreover, I had excellent access to infrastructure. My stay was very fruitful.’ KIT also welcomed Aluwani Nemukula (South Africa, 2009), now researching algae at the University of KwaZulu-Natal. He has returned twice and maintains contact with KIT’s researchers in bioprocessing engineering. 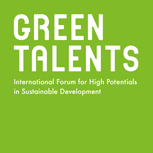 Quite often, then, Green Talents’ research stays create or strengthen international collaboration. Germany’s drive for knowledge transfer ensures that new knowledge gets feeds into the production of sustainable products. Daniela Morais Leme (Brazil, 2010), Adjunct Professor at Federal University of Paraná (UFPR), stayed at BASF. ‘I improved my knowledge of in vitro toxicology and increased my understanding of the relationship between the goals of industry and academia, and established international scientific collaboration. I keep contact with BASF’s senior vice president of experimental toxicology and ecology’. Public policy collaboration is also essential to sustainability and Guan Ting (China, 2011), postdoctoral research fellow at School of Public Policy and Management at Tsinghua University, specialising in environmental and energy governance maintains contact with her professor colleagues at University of Duisburg-Essen, after an ‘intensely fruitful’ research stay. These examples of Green Talents’ research stays highlight 22 valuable German and international research venues. If you look at the research stays of all the Green Talents you will find 200 reference points to start your exploration of Germany’s sustainability and climate change research networks and their connections around our vulnerable ecosystem, the Earth.